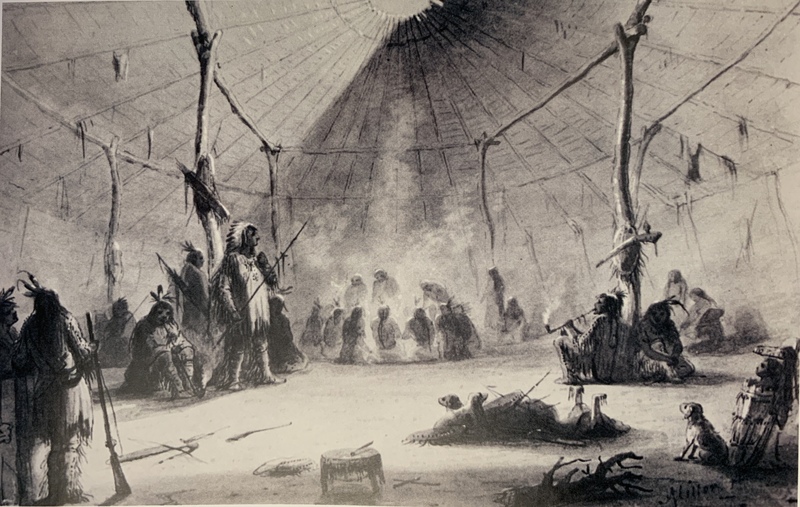 In the mid-1800s, the fur trade expanded to the American West, with mountain men trappers, merchants and American Indian tribes eager to exchange their wares at trading posts across the frontier. While the opportunity to swap pelts, ammunition and ingredients initially brought these traders together, the meals they shared at these posts provided rare and welcome moments of community on the expansive prairie. 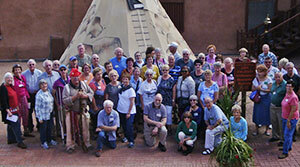 At popular trading posts like the original Bent’s Old Fort, guests were welcomed with an impressive meal. Professional cooks prepared noteworthy dishes, which were a happy distraction from the typically bland and rationed food the arriving traders had grown accustomed to along their journeys. One such cook at Bent’s was Charlotte Green, who prided herself on being the “only lady in Indian country (8).” Green was renowned for her famous pies, which accumulated a dedicated following among those she served. Drawing by Alfred Jacob Miller, Walters Art Museum, Baltimore, Maryland (7). What else was on the fur trade era menu? Visiting Indian chiefs were often greeted with liquor, prunes and ship’s biscuit, a hard cracker made from flour, water and salt. Hearty proteins such as bison, beef and mutton were also popular staples, complemented with butter, cheese and bread. In addition to stiffer drinks, coffee became a favorite fur trade era beverage because its caffeine brought renewed energy to travel-weary traders. Similar to trading post meals, it was also customary for Indian tribes to provide feasts for arriving traders and their crews. English fur trader and Indian interpreter John Long recorded a feast prepared by the Fox Indians of Wisconsin, which consisted of “five dogs, a bear, a beaver, a mountain lion, a deer and a raccoon, all boiled in bear’s grease and mixed with huckleberries (3)” – a memorable meal indeed! While food was primarily used to welcome travelers, it also proved useful in building relationships and maintaining peace. When the Cheyenne and Kiowa tribes sought to resolve a conflict that had cut off Kiowa access to Bent’s Old Fort, the Cheyenne served a conciliatory meal of rice, dried apples and corn meal, all sweetened with molasses. When trading posts weren’t welcoming Indian chiefs and fur traders to swap goods, they reserved their most impressive feasts for the holidays. The Christmas menu, for example, often included all manners of boiled, stewed and roasted meat, flavored with an abundance of imported salt. For a holiday treat, traders enjoyed rice and bread puddings, dried fruits and flour cakes, all washed down with more of that invigorating new drink called coffee. Thankfully, American cuisine has improved since the days of the fur trade era, but these shared meals formed the basis of Western expansion, and were integral to the circulation of goods across the country. The fur trade may have fallen out of fashion, but to this day, successful business deals are still made over the promise of a nice, warm meal. Source: The Encyclopedia of Trade Goods, Vol. 6: Provisions of the Fur Trade, p. 3-9.